Antennas for airborne communications systems must have good omnidirectional coverage and efficiency, and must be well matched to the transceiver. For high performance aircraft, aerodynamic effects should be minimized and installation should be simple, to reduce aircraft modification costs. The antenna must also be designed to cope with environmental phenomena such as lighting strikes, rain and hail erosion, UV degradation, water ingress and static charge build-up. 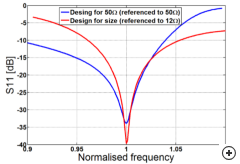 These factors invariably require the antenna to be enclosed in a fin-radome and mounted on the center line of the fuselage, with a DC discharge or connection path to the ground or reference plane of the feed electronics. 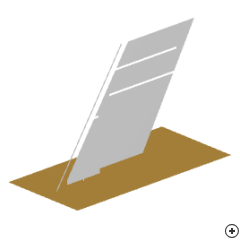 The blade antenna included in the Antenna Magus database for the Version 2.4 release is a simple planar meander-monopole blade, with a base-feed and a conducting leading edge for mechanical support and lightning protection. 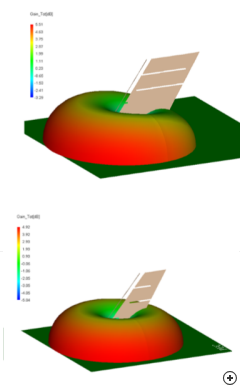 This topology is simple and lends itself to housing in an radome structure.